Plumicorn [PLU- MI-CORN] (noun): A tuft of lengthened feathers found on the head of various owls. The origin of this fun word comes from the Latin words “pluma” meaning feather, and “cornu” meaning horn. When we think of plumicorns, the Great Horned Owl is one of the first owls that comes to mind for most of us because their plumicorns are quite prominent. Because of their placement and their appearance, plumicorns are often thought of as ears however, they are not ears and actually have nothing to do with the owl’s hearing! There are many different theories around why certain owls have these ear tufts. Some of these theories are related to camouflage, communication, as well as species recognition and threat displays. So if the plumicorns are not their ears, where are their ears? They are hidden under those curved lines of dark feathers that form a facial disc on either side of the owl’s face. The Great Horned Owl can actually raise these short facial disk feathers to amplify sound. The effect is similar to that of you putting your hands behind your ears. Their ability to pick up sounds is so powerful that they can hear a mouse moving under of foot of snow or moving on the forest floor from a soccer field away! What is even more interesting is that their ears are offset, with the right ear being a little higher than the left. Because of this, sound reaches one ear slightly before it reaches the other. The owl will tilt its head until the sound equalizes. Once it does, they will be staring right at their prey. 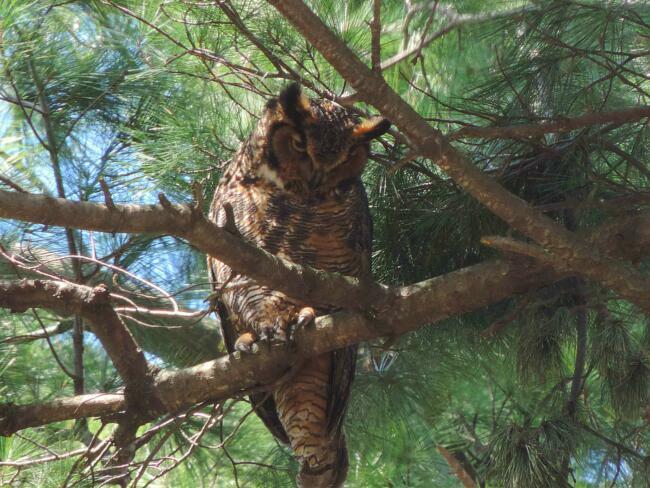 If you’re trying to spot Great Horned Owls in the park, look for those plumicorns hidden among the pine trees!